Enter This Month’s FREE Facebook Give-a-way! WIN OUR FREE MONTHLY DRAWING! By entering to win our FREE Monthly Facebook Contest you are in no way required or obligated to use Absolutely Clean’s services. Absolutely Clean is a small business that prides itself in our personal touch and dedication to our clientele and staff! 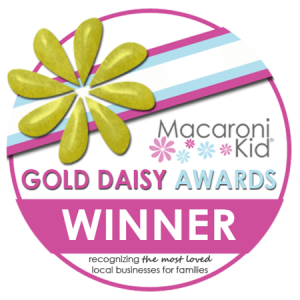 We love giving back to the community! You can trust us in your home and we welcome you into our family! Contest Rules: Must be 18 years of age, must be a fan of our Facebook page — Extra entries every time you post a comment about our daily post. Please provide the following information for us to process your new registration and make sure to fill out all information marked with an * AND REMEMBER! Part of this entry is Clicking our LIKE button on Facebook: Once you click Submit the Form will take you to our FACEBOOK page. Just click on the LIKE button and you will be automatically entered into the Current iPad Drawing. Thanks for stopping by. Receive a $25 Cleaning Credit! 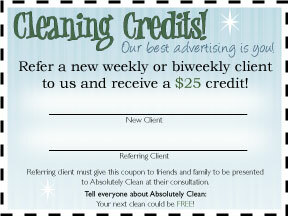 When you refer a new weekly or biweekly client to us, you will receive a $25 credit to use on your next clean! Tell everyone about Absolutely Clean…your next clean could be free! To redeem this offer, print this page or click on the image below to print out the coupon page and give this coupon to your referred client for redemption upon their initial consultation.